To use the one-handed mode in Apple's default keyboard, just make sure you're running at least iOS 11 on your iPhone, so this works in iOS 12 as well. Also, before going further, it's worth noting that this only works in portrait orientation. 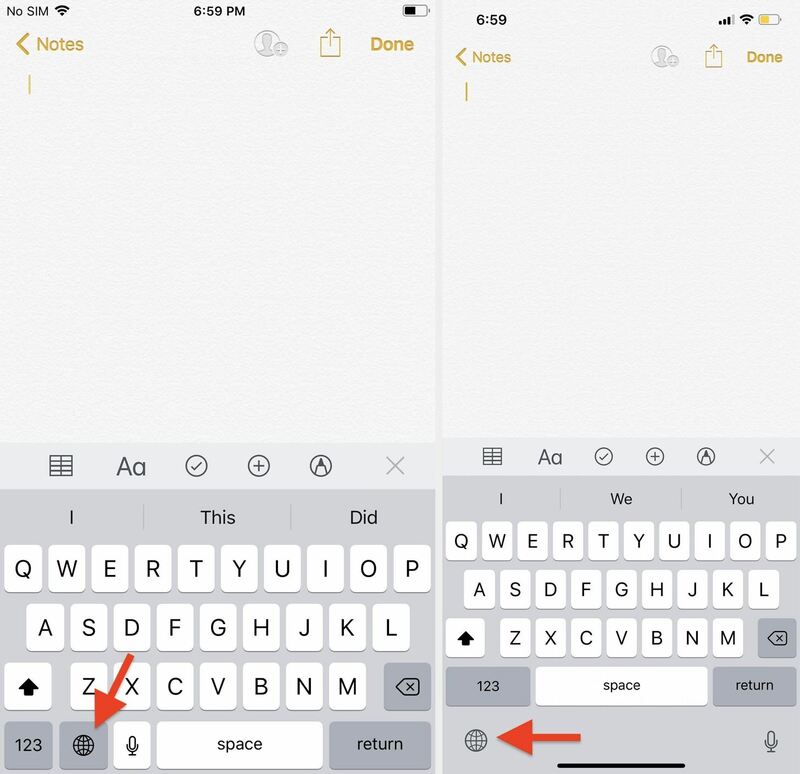 When using the stock Apple keyboard, long-press on the globe icon next to the "123" key (on older iPhones) or in the bottom-left corner of the screen (on Face ID iPhones) to bring up the keyboard menu. An older Touch ID model (left) vs. a newer Face ID model (right). If you don't have any third-party keyboards installed or any additional languages from Apple enabled, you'll see a smiley emoji instead of a globe. For those of you who don't see a globe or a smiley there, it's because you don't even have the Emoji keyboard enabled for some odd reason. To make it clear, you cannot use Apple's one-handed keyboard unless you have either the Emoji keyboard, a different language keyboard, or a third-party keyboard also enabled. You'll need at least one additional keyboard besides "English (United States)" or whatever your primary language is. After long-pressing the globe or smiley, below the list of enabled keyboards you can switch to, you'll see icons for left, center, and right orientation for Apple's stock keyboard. If you use your iPhone with your left hand, choose the left orientation. If you use your iPhone with your right, choose the right orientation. Whenever you want to return to the center position, just tap on the arrow opposite of the left or right positioned keyboard to expand it back to full width. These options work for any of Apple's available "iPhone Keyboards." However, note that if you're currently using the Emoji keyboard, you'll see either an ellipsis (•••) or "ABC" icon where the globe or smiley was, but long-pressing on either option also opens up the keyboard settings panel. While I love this one-handed feature, it's not enough to make me want to switch from my preferred Gboard keyboard, especially since Gboard also added a one-handed typing mode. To get to this in Gboard, long-press on either the globe icon next to the "123" key (for older iPhones) or the cog icon just left of the space bar (for Face ID iPhones), then select "One-handed mode." It will automatically squeeze the keyboard to one side, and you can tap the arrow to switch sides or the expand icon to go back to full size. Swipe input even works in Gboard's one-handed mode, but just like Apple's version, it doesn't work in landscape orientation. If Apple implemented swipe input, I might finally switch back full time.